The "LBD" or "little black dress" is supposedly a staple in every woman's wardrobe, but if you happen to be a little shy of showing too much leg, (or any leg at all!) 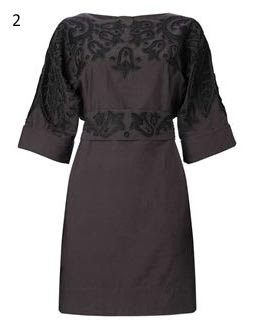 there are ways you can look fab in a range of not-so-litte black dresses which have sleeves or can be worn with shrugs, and which don't look really stupid when worn with jeans or leggings underneath! Look #1 is for girls that don't mind wearing something a bit more fitted and clingy. The look is comprised of a "Warrior" sequin embellished dress (£80), worn with black rouched leggings (£18), shirred bolero/shrug (£25) and finished off with zebra striped platform shoes (£90) all from Oasis. Dress #2 comes courtesy of French Connection (available for £110) and is great if you want a looser style, the matching belt helps create a bit more shape at the waist and the batwing sleeves are ideal if you want a bit of arm coverage. The neckline on this dress is also good if you're a bit shy of showing too much chest. 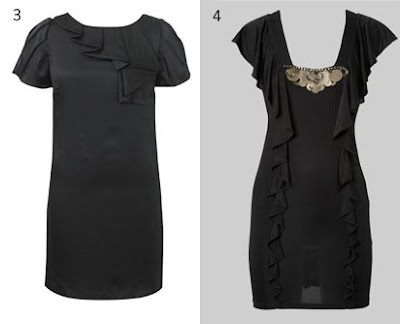 Dresses #3 and #4 are for frill seekers! Dress #3 is a more formal dress with a round neckline, it's not really suitable to be worn with tousers, but you could get away with tights or leggings underneath. It's available from Coast (priced at £115). 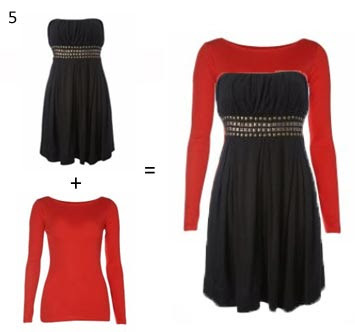 Dress #5 is a great value for money at just £22 from New Look. As demonstrated you can wear this over a plain tshirt or long sleeved top, and it doesn't even have to be black!